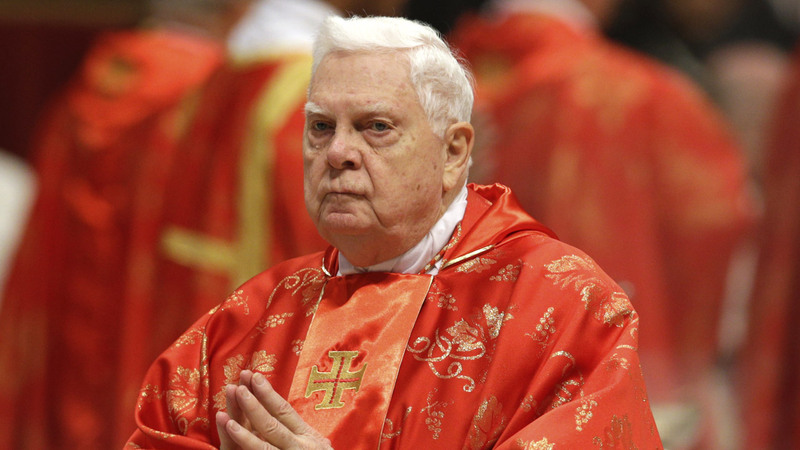 BOSTON -- Cardinal Bernard Law, the disgraced former archbishop of Boston whose failures to stop child molesters in the priesthood sparked what would become the worst crisis in American Catholicism, has died, a church official said Tuesday. He was 86. Law had been sick and was recently hospitalized in Rome. The official who confirmed the death was not authorized to make the announcement and asked to remain anonymous. The Vatican was expected to make a statement later Wednesday. Those reports and the investigative reporting pursued to uncover the scandal would later be recounted in the 2015 Oscar-winning film "Spotlight." Law was expected to leave a far different mark on the church. Born Nov. 4, 1931, in Torreon Mexico, Law was the only child of a U.S. Air Force colonel and a mother who was a Presbyterian convert to Catholicism. He was educated throughout North and South America and the Virgin Islands before graduating in 1953 from Harvard University. He was ordained in 1961 and campaigned for civil rights in Mississippi, sometimes traveling in the trunks of cars for safety. After a post with the national bishops' conference, he was named bishop of the Diocese of Springfield-Cape Girardeau in Missouri, then archbishop of Boston in 1984, a prominent appointment to the country's fourth-largest diocese. Law was a prominent voice in Massachusetts and beyond, especially as abortion. He publicly challenged public officials such as Gov. William Weld and Lt. Gov. Paul Cellucci over their support for abortion rights. The cardinal was among a chorus of bishops sharply critical of Geraldine Ferraro, the 1984 Democratic nominee for vice president and a Catholic over her support for abortion rights. Under President George W. Bush, Law was a regular visitor to the White House. However, Law's legacy has been overshadowed by the scandal. In the notorious case that started the 2002 crisis, as recounted in "Spotlight," the Globe reported that Law and two of his predecessors as Boston archbishop had transferred former priest John Geoghan among parish assignments despite knowing he molested children. More than 130 people eventually came forward to say Geoghan abused them. The archdiocese paid $10 million in settlements with 86 of his victims and their relatives as Law was clinging to his job. It was nowhere near enough to ease the growing anger.